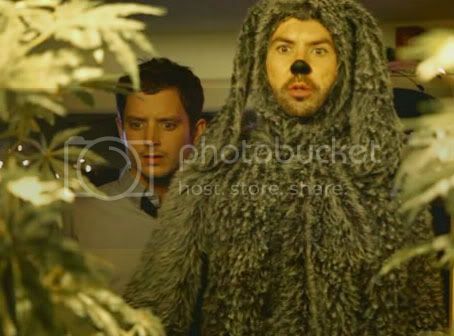 After viewing the first three episodes of FX's surreal new comedy series, Wilfred, it's easy to see how the show can continue on past its initial concept. What is not as clear would be what to expect tonally from the series week to week, a trait shared with the series' time-slot buddy, Louie. So far, every episode of Wilfred has held a simple one word theme such as 'Happiness', 'Trust', or 'Fear' that the lead duo must work through usually in a very delightfully warped manner. Relying on a through-line plot every week hasn't been as important to the series as attention to its dialog. Wilfred is as charismatic spouting off stoner pseudo-philosophical musings as he is with crude toilet humor--all strictly from a true dog's point of view. In case you have absolutely no idea what the hell that weird talking dog show on FX is about, allow me to fill you in. 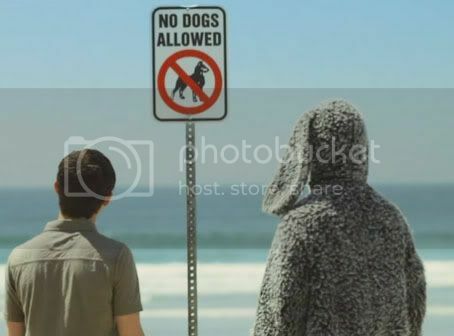 Following a botched suicide attempt, disaffected former lawyer Ryan (Elijah Wood) is introduced to his cute new neighbor's pet dog, Wilfred. Only the thing is, while everyone else in the world sees an actual dog--Ryan and the audience see a lewd mischievous Australian man in a cheap dog costume (the devilish Jason Gann who played the title role in the original Australian series as well). There seems to be an unspoken decision made in Ryan's mind after he survived his attempt that clearly the reason he can understand Wilfred would be that he's somehow going to help him get his life back on track. A two-legged embodiment of 'man's best friend' if you will. Within moments it becomes clear that Wilfred believes himself to be the best thing that ever happened to Ryan's life, while we at home know that Ryan's life will never be the same once he starts following the 'advice' of his new friend. So far, as Wilfred teaches Ryan how to truly 'start living', he has encouraged Ryan to commit acts of property damage, breaking and entering, trespassing, and theft. Also by the end of every convoluted lesson, Wilfred manages to increase Ryan's dependence on him as the only one who can make him feel good about his life. 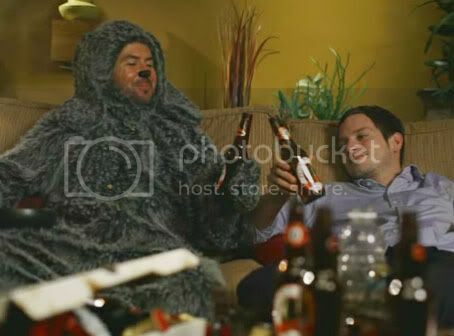 In fact, Ryan's only achievements other than committing these acts of social disturbance would be to sit around and get stoned with Wilfred, or make ill-fated attempts at flirting with Wilfred's owner, Jenna (Fiona Gubelman). Even as Ryan descends further away from the commonly-accepted idea that conventional success equals personal happiness, there is certainly no denying that he finds great charm out of living as carefree as a real dog. It appeals to the reckless teenage boy in most twenty-something young men to shuck away all responsibility and do exactly what you want every minute of the day. It was made perfectly clear in the pilot that part of the reason why Ryan was in such a dark place after losing his job in the first place would be that the path he was being put on and the pressures of his successful family, (consisting of a sister and father who are a doctor and lawyer respectively) wasn't one he ever wanted for himself. It also cleverly gave the show no need to have to wonder about seeing Wilfred in other contexts of Ryan's life such as being brought into a workplace environment. The two tend to mess around all day like live-action cartoon characters--getting into wacky and often dangerous misadventures. By keeping the supporting cast limited, the main focus remains on the show's greatest strength: the sometimes easy, sometimes antagonistic chemistry between Elijah Wood and Jason Gann. Their relationship reminds me greatly of the pair of the name-less narrator and Tyler Durden from the film Fight Club. Ryan lived an ineffectual existence pre-Wilfred, one of tasteful, yet soulless, bachelor condos and the pretentious use of words such as 'ineffectual' and 'effete' in normal conversation. A nice guy at the core who seems to have let others make his life's decisions for him, but has now finally woken up to try and figure out what it is he really wants. Whereas Wilfred is destructive, brash, unfiltered, manipulative, and a huge fan of causing mayhem for mayhem's sake. Which is just like Tyler Durden but it also really is just like how a dog would be. The show makes a constant note to remind its audience that Wilfred is still a normal dog despite everything 'human' he might do. Some of the show's best lines have come from this fact. 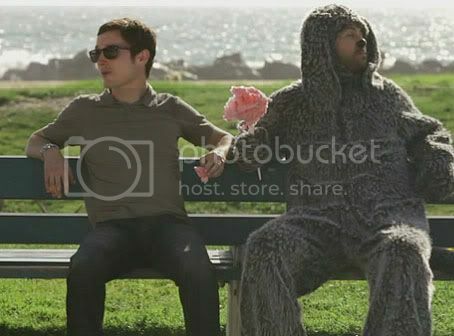 Wilfred's creators are quite self-aware that the concept of the show might lead to fan speculation as to the reasons why Ryan can see Wilfred and hear him the way he does. And they use this fact to screw with the minds of the viewer from the pilot onward. Obvious answers such as attempting to overdose on pills get thrown out when it's revealed he only tried to o.d. on placebos. The most popular in-show theory would be that Wilfred, much like the aforementioned Tyler Durden, is a mental construct that exists solely in Ryan's sub-conscious.Various conversations from the pilot episode onward toy with that idea without any concrete resolution. The minds behind the show understand that it's much better to have the audience mimic Ryan's role in the proceedings to agree upon following Wilfred wherever he may lead them. I know I've been happy to follow this quirky (God that word is used way too much but this show really merits it) tale and its distinct anti-hero from a network that isn't afraid to showcase life's underdogs. I made it all the way to the end with only one 'dog' pun so I feel good about that. This is a fantastic review! Not only does it flow very well but you hit on the most interesting aspects of poor Ryan's predicament as well on touched theories as to why he may be seeing his furry friend. I really really love the tie-in with Fight Club considering there is much plot to be had in a situation like that, and I hope that Wilfred takes that route. I have yet to watch this show but your review has made me want to even more than before! Great show, keeps getting better too! I agree with Mabetini, great review. Spot on.